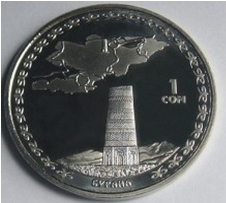 Copper-nickel coin (in Mint capsule). 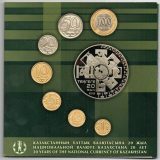 Collection coins of the series “Kyrgyzstan on the Great Silk Road” are dedicated to the ancient monuments of the Great Silk Road – Burana Tower, Tashrabat, Uzgen architecture complex, Sulayman-Mountain and Lake Issykkul which are situated on the territory of Kyrgyzstan. The Great Silk Road routes are marked on the map of the modern Kyrgyzstan. 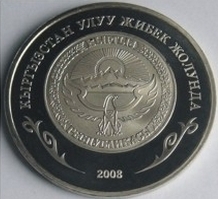 The major compositional motif of reverse coin is the Kyrgyz Republic National Emblem.